At least 90% of diets end in failure and for chronic dieters, this can mean years of compounded frustration, disappointment and shame--baggage that won't make weight loss any easier the next time. But in The Diet Fix, Dr. Yoni Freedhoff breaks down the flaws in the way that we approach dieting and offers an exciting plan that will empower anyone to achieve lasting results. Combining years of medical practice and cutting-edge research about metabolism, nutrition and willpower, The Diet Fix exposes the 13 myths of modern-day dieting that so often interfere with weight loss as well as dieting's 7 deadly sins that so often lead to failures. Next, he presents a program that will reshape the way people mentally and physically approach dieting. In just 10 days, anyone will be able to see and feel results from this positive new method. In addition to being a proven, stand-alone weight loss program, The Diet Fix can also be applied in conjunction with any other diet, from Weight Watchers to Paleo to South Beach and more. Dr. Freedhoff provides detailed instructions for readers who want to reset their favourite weight-loss programs, turning them into the permanent success stories they were originally promised. This easy-to-use reset empowers dieters to navigate real life with a healthy, positive and constructive attitude--one that will prevent them from slipping back into the negative patterns that destroy weight-management success. "The Diet Fix delivers. This is a wonderful approach to tackling the Diet Demons. It allows people to keep what they like most about food -- the taste and indulgences -- and to get rid of what they don't like about food -- overeating and guilt. It's about balance. Regaining balance in our diet as well as in our lives." "Here finally is a book capturing the nuts and bolts of the dieting culture that has gripped North America. With Dr. Freedhoff's presentation of fact supported by years of first-hand experience, a crystal clear picture of what works, what doesn't and what is myth emerges. The Diet Fix is a service to all." 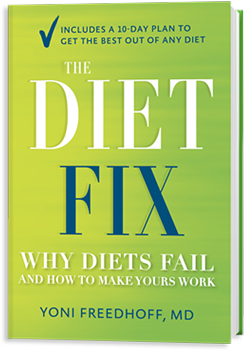 "The Diet Fix is a breath of fresh air, revealing exactly why diets are such exhausting, ineffective traps and providing a do-able roadmap for a new, healthier way of approaching food and weight. It is an eye-opening and helpful diet antidote." Alex Hutchinson, author of Which Comes First, Cardio or Weights? How many calories do you burn, how many should you eat, and how best to spread them around?